Raising rent isn’t an easy task for landlords because it requires a combination of effective business skills, cordial relations with the tenants, marketing research to evaluate the current, true value of your rental unit, and doing the rent increase in full compliance with California Landlord-Tenant laws regarding rent increases. It doesn’t matter if you are a new landlord or have been in the renting business for long but haven’t ever raised rent there are various aspects that you need to keep in mind prior to doing so in California. The process of raising rent in California is not as simple and easy as you may assume, It is much more complex and demanding action that may result in loss of tenants or your reputation if done inappropriately. 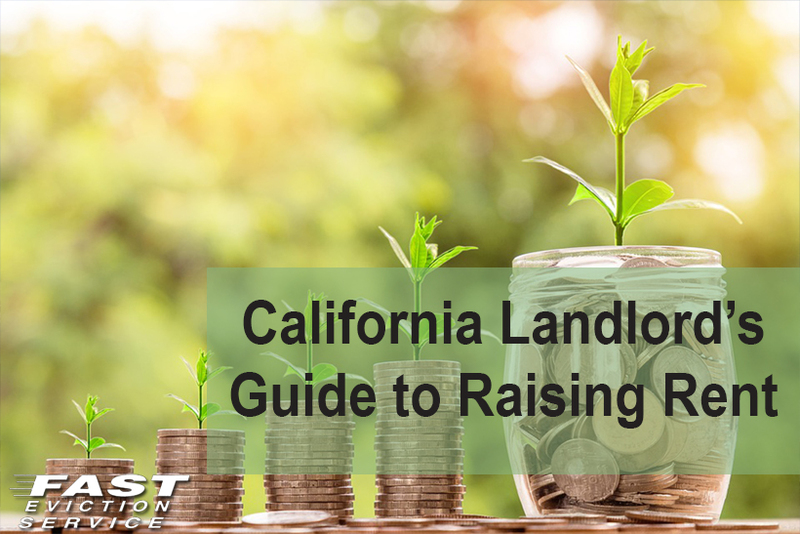 Therefore, for landlords who want to increase rent in California, this article will serve as the ultimate guide offering helpful tips. Remember that the information provided here is generic and universally applicable. If your property is in a rent-controlled area then you need to follow specific rules and regulations for that city. The most frustrating tasks of all is to determine the amount of new rent because charging too much will be unreasonable and charging too little will be less-profitable for you as the landlord. To decide about the exact rent amount, you need to compare your rental property to other units in your area. However, you shouldn’t follow others solely because there are several other factors that are to be considered such as the condition of your rental unit in comparison to other properties and the status, that is, brand new or decades old. So to be an effective landlord, what should you do? If you keep these tips in mind, you will get a true reflection of the market rate for your property. It may take a lot of research and perhaps your free time will be consumed but isn’t it all worth it if you will make a bit more profit? For more on How to Price Your Rental Correctly. How to Establish Rent if the Property is Vacant? It is not necessary that you need to raise the rent of an already rented property but may choose to do so for a vacant one. When you have carried out the research process comprehensively and have gotten to the point where you have decided about the new rent, it is time to think about advertising. Start marketing about the rental unit with the latest rate and dont select a few of the local listings but go all-out and publish/post the ad on all of them. You can opt for a variety of platforms including Craigslist, Newspapers, Rental publications, online rental property websites and even brokers. Study the kind of feedback you receive in response to your ad. If you don’t receive too many calls from interested applicants, the rent is probably too high and people aren’t too inclined to pay it for the property. However, the key to being an effective landlord is to be patient in such a situation instead of immediately dropping the rent. You may adjust the property description and make it look more appealing to your prospective tenants. Try to keep expanding your marketing mediums as well to reach out to wider array of tenants. When you and your existing tenant(s) signed the lease agreement, as a landlord you must have clearly specified the rent amount to be paid every month and the terms of the lease agreement. This agreement is signed to lay out the rules of renting the property as well as the conditions of raising the rent. Such as, many landlords include a term about raising the rent after every 12 months’ time. So, until the time is elapsed you cannot raise the rent. In case you did not include any such condition about raising the rent, then you need to check the law of your state to understand after how many months you can increase the rent as well as the time required to notify the tenant about rent raise. Evaluate your own situation and always stay compliant with the law. Some states like California regulate the rent raise percentage for landlords and the time frame the notice must be given before the rent increase takes effect. If the agreement has been signed on a month-to-month basis, they have been a tenant for a year or less and there is no written lease agreement then you can raise the rent anytime. All you need to do is give the tenant a 30-day notice regarding rent increase in California. If they have been a tenant for more than one year on a month to month rental agreement a 60 day notice to raise rent is necessary in California. If you have done your research of rents in your area and know the true current market value of your rental unit, whether you are a California landlord raising rent on an established tenant or a landlord raising rent for new tenants, your ability to speak with authority knowing the facts and the law are your greatest asset raising rents.